With so many cool, new characters kicking around in the comics the past few years, Marvel has started using its animated series lineup as a de facto proving ground for new characters. Up next? Everyone’s favorite new Spider-person. 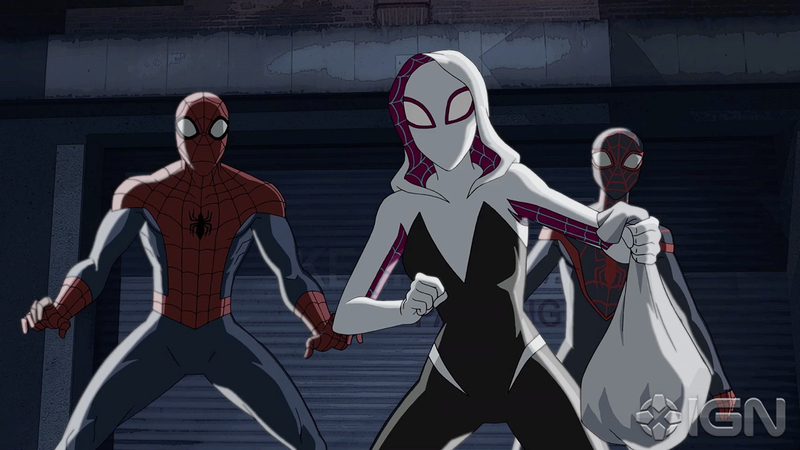 IGN has the first look at Spider-Gwen’s animated debut in the Disney XD series Ultimate Spider-Man, and (not surprisingly) she looks awesome. If you’re unfamiliar, Spider-Gwen is a version of Gwen Stacy from Earth-65 who gains Spider powers after the Peter Parker from her universe dies. If you’re not reading the ongoing comic series, you should be, and it’s great to see her get a shot to jump from page to screen so soon after her comic introduction just two years ago. The episode will be included in the ongoing fourth season of Ultimate Spider-Man, with Gwen voiced by Dove Cameron (Liv and Maddie, Descendants). Along with Gwen, the episode will also bring Miles Morales back for another adventure, as part of a universe-busting “Return of the Spider-Verse” storyline. Milo Ventimiglia will also be back to reprise his role as Spider-Man Noir, along with several other alt-Spideys coming out of the woodwork. Ultimate Spider-Man vs. the Sinister Six: "Return to the Spider-Verse" kicks off Saturday, Aug. 27, on Disney XD. Part two airs Sept. 3, part three on Sept. 10, and part four on Sept. 17 (Spider-Gwen is slated to show up in the final episode).